I have often pondered how life managed to work before the invention of the internet. Need a recipe? Google it. Kid has a weird rash? Google it. Ants invading your laundry room? Google it. I would be hard pressed to find a situation that I couldn't find a solution to on the internet. When I started greening up our life at home, the internet was crucial. The first thing was having a wonderful group of mamas who always seem to be a step (or 2 or 20) ahead of me in the natural game. I can always jump online, surf over to The Mamasphere and ask any one of a million questions I have. Whether it's about nutrition, cleaning, diapers, sickness, this group of friends is my go-to for talking about what ails me. Then there is the ever faithful Google. Ah Google, how I love thee. Let me count the ways! If you don't know what Google is, well... even vampires use it. Get with the times! There is a never ending and always replenishing source of natural information just waiting to be discovered. Today I was washing dishes and pondering the chemical laden Cascade that I was about to use. It works fantastic, but with everything else I'm changing is it really worth the risk? Let's see. Here's a list of ingredients from the dishwashing detergent I am currently using. Hmmmm, funny. But no matter how many times I visited or reloaded the Cascade website I couldn't get the PDF for their ingredient list to load. Odd, no? Either way it's safe to say that their list is likely not full of safe ingredients. I started doing a little research and found several common ingredients for homemade dishwashing detergent. Vinegar is the go-to rinse aid, and I have been using it for a few years and can attest that it works amazing! and for those concerned with the vinegar smell, what slight aroma you might catch while the dishes are rinsing dissipates like the steam from the dishwasher. But your dishes are left all sparkly and unwaterspotty (<- Not a real word). There does appear to be a little bit of controversy over the Borax addition, mainly because of an article posted by Environmental Working Group on Enviroblog. The first "issue" cited is that it has a couple different names. So do I... 3 of them in fact. As do fruits, vegetables, bugs, and many many other things. That are completely natural. A rose by any other name, and all that jazz. Then it switches up from calling Borax a mineral to a pesticide. Last time I checked those 2 aren't exactly bosom buddies. I wonder if Tom Hanks would be mineral or pesticide? I think mineral. But I digress. Then there is this little ditty about the "short-term and long-term health effects". A little excerpt for your viewing pleasure. "Short-term irritant. Borax can be irritating when exposure occurs through skin or eye contact, inhalation or ingestion. Poison reports suggest misuse of borax-based pesticides can result in acute toxicity, with symptoms including vomiting, eye irritation, nausea, skin rash, oral irritation and respiratory effects. Toddlers and young children face special risks from hand-to-mouth transfer of carpet or crack and crevice, dust or spray borax treatments.Hormone disruption. Borax and its cousin, boric acid, may disrupt hormones and harm the male reproductive system. Men working in boric acid-producing factories have a greater risk of decreased sperm count and libido. According to EPA's safety review of these pesticides, chronic exposure to high doses of borax or boric acid causes testicular atrophy in male mice, rats and dogs." 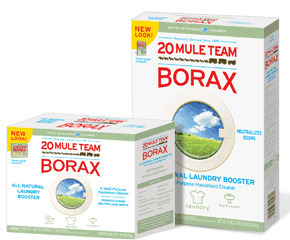 Borax is wholly natural. It doesn’t cause cancer, accumulate in the body, or absorb through the skin. It is not harmful to the environment. In fact, the largest borax (borate) mine in the world – found in Boron, California – is considered by many to be the most ecologically sound and environmentally sustainable mine in the United States. This is also the mine where 20 Mule Team comes from. So, all of that to say as soon as I can lay hands on some Citric Acid I will be making my own batch of dishwashing detergent. I guarantee my family won't even know the difference, and I promise to share the results and the recipe with you! It had never occurred to me to be concerned about my dishwasher soap! I'm intrigued at the idea of making my own. Citric acid is easy to find--go to the canning section at Walmart. How did it all work out! What's your recipe?? I still haven't layed hands on any citric acid, but I think I am going to just order some from Rose Mountain Herbs and get started.